I love this outfit. It's super easy, and it can be casual with a pair of sneakers or loafers, or easily dressed up with a boot or a heel and a statement necklace. 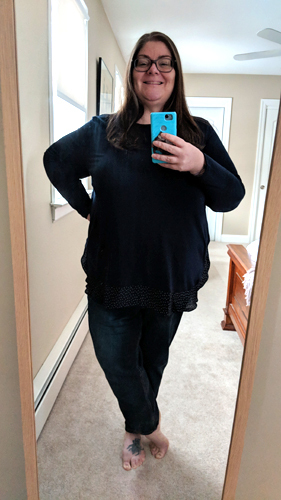 The top is Loft's Plus Dotted Flounce Mixed Media Shirttail Top, and the bottoms are Torrid's Short-Length Ankle Zip Stiletto Jean in dark wash. I got both of them awhile ago, so they're not available in every size now, but Loft has lots of similar mixed media pieces and Torrid has lots of great jeans in dark washes. I've worn and washed these jeans countless times in the two years or so I've had them, and, as you can see, they've held up the dark wash really well. I continue to swear by Torrid's jeans!